The Best Companies Group offers Alabama businesses a chance to evaluate how well they measure up as great employers — both in the eyes of their employees and in comparison to other companies across the state. 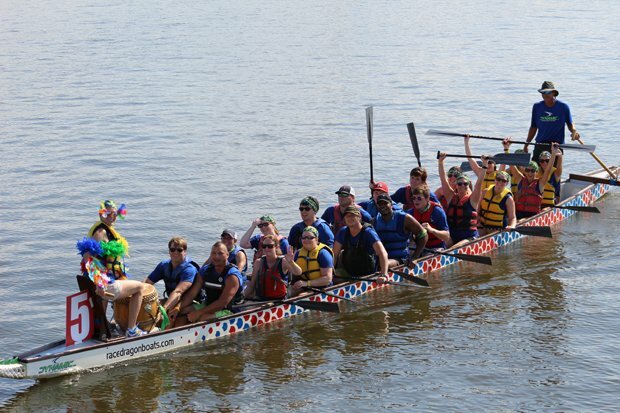 Wilkins-Miller employees are off to the Dragon Boat races. How do you become one of the best companies out there? Many Alabama firms believe a good first step is becoming one of the best companies to work for – so that you have the opportunity to attract and hire the best potential employees – and keep them once you’ve got them. This year, 16 firms have been honored as among the Best Companies to Work for in Alabama. Edward Jones, an investment firm with an array of individually managed offices in towns across Alabama and the nation, topped the 2016 list for large companies. More than 300 people work for Edward Jones in Alabama. The company moved up from second place in both 2014 and 2015 to top the list this year. Welch Hornsby, also a financial services firm, took top honors among small-to-medium firms. The Birmingham-based firm has 26 employees in Alabama. The firms are ranked after an extensive review by Best Companies Group, which evaluates many aspects of the company culture — such as vacation and sick time, fitness facilities, chances for advancement, community engagement, training, telecommuting and business dress. Employees are surveyed about topics such as their ability to make suggestions or to feel that their contributions are appreciated. Beyond the honor of being recognized as a great place to work, companies also get feedback from Best Companies so they can respond to any issues their employees raise and move forward as a desirable workplace. And Sandra Stenger, chief talent officer with Max Credit Union, says: “We’re moving the needle in the right direction. It’s good to see the changes we make lead to improvement.” Business Alabama introduces this year’s winners here. Tom Little and Nancy Mann Jackson are freelance contributors to Business Alabama. Little is based in Birmingham and Jackson in Huntsville.